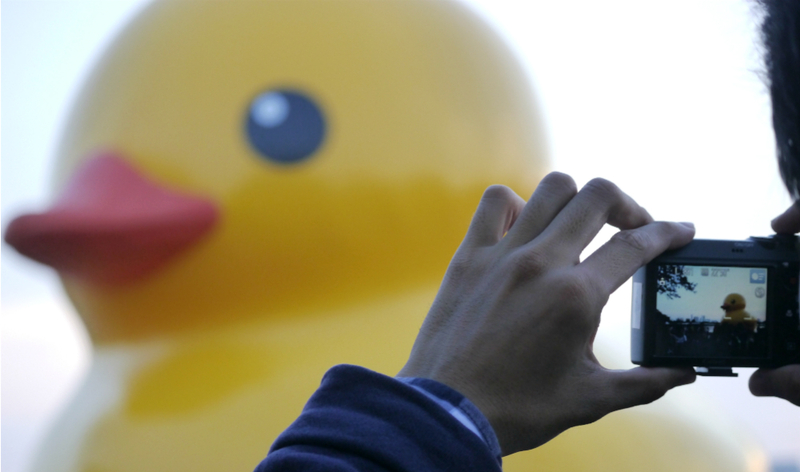 A man takes a picture of the giant Rubber Duck with his compact camera. Thousands of Vietnamese and foreigners on Sunday filled up the area around Ban Nguyet (Crescent) Lake in District 7, Ho Chi Minh City, to have a look at and take pictures with the giant Rubber Duck, using all possible kinds of equipment, from feature phones, smartphones, to compact and digital single-lens reflex cameras. The 600kg duck, an iconic work of internationally-acclaimed Dutch artist Florentijn Hofman, is a huge version of kids’ popular yellow toy duck which is stylized to entertain spectators, particularly children. Beginning with a tour titled “Spreading Joy around the World” in 2007, Dutch artist Florentijn Hofman said he wanted to recall everyone’s fond childhood memories by showcasing the duck in 14 cities around the world, starting in his hometown, Amsterdam. The adorable duck has since been exhibited in such cities as Lommel (Belgium), Osaka (Japan), Sydney (Australia), and Hong Kong (China). During its trip to HCMC, the giant Rubber Duck will be the spotlight of a five-week fest running until May 31 in District 7 with a series of activities, including taking fun, creative photos with the duck, dance and rock shows, acoustic concerts, performances of Vietnam’s water puppetry, book fairs and souvenir booths. The duck, the world’s largest of its kind, has different dimensions each time it arrives in a new venue. For its appearance in Vietnam, technicians spent one month building the 25m x 18m x 18m duck, which is positioned on a specifically-designed 15m pontoon. The stylized animal is made from over 200 pieces of PVC (polyvinyl chloride) and has an opening at the back so that thorough checks can be conducted. It also has an electric fanning system, which is connected to main electric currents beneath the lake surface, allowing it to be inflated at any time and in all kinds of weather.